I bow thousand times to respected and esteemed Shri Gurudev Shri Shraddhanathji Maharaj. Since beginning, it has been my good fortune that I enjoyed Shri Babaji Maharaj’s company and he only showed me the correct path. I feel very fortunate to find such a perfect guru, who always guided me and took care of me. Shri Babaji Maharaj was always reluctant to write or praise himself but it is also not appropriate if glory of such gurus doesn’t reach the mankind. I have witnessed so many miracles of Shri Babaji Maharaj that if I start narrating all of the incidents; I will not be able to complete them in my lifetime. For me, whose entire life is surrendered to Shri Babaji Maharaj, only if Mother Saraswati helps it may be possible to describe all about him. Still I am writing down few sweet memories which today also keep reminding me about him. 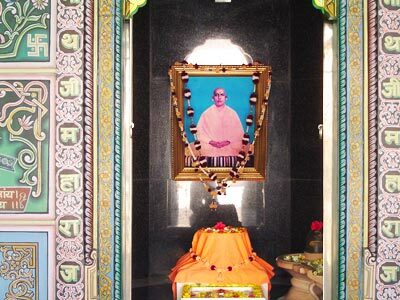 I seek Shri Babaji Maharaj’s forgiveness in case I have made any mistakes. My life’s first incident took place during the monsoon season in 1965. I had gone to Paladi village with my elder brother and I felt like going for a swim in the village pond. The pond was completely filled and I didn’t know swimming. I requested my brother if he could kindly teach me swimming. He said yes and we walked to the pond. When I saw the pond filled to the top, I decided that I was not going to go in the water and sat at the corner. My brother was a good swimmer. My brother dived in the water wearing a dhoti (traditional dress) and soon he was in the middle of the pond. He dived again but this time when he went in, his dhoti got stuck in some branch of a thorny bush sticking out from the bottom of the pond. No matter how hard he tried, he was not able to free himself from the branch. I understood the gravity of the situation and started shouting “please help! please help!” However, there wasn’t any one in the sight for miles. Then I remembered my guruji and said “either you save him or else I am also going in the water and will give up my life”. Thus decided firmly, by remembering my guruji, I started entering the pond. When the water was about waist high and as I was about go further, a boy came from no where and dived in the water. He pulled my brother out of the water. That day, if two more minutes would have passed both of us brothers would have died. We were saved that day by Shri Babaji Maharaj. Top My life’s second incident was even more dreadful. In 1990 I was admitted to All India Medical Science after my heart attack. I was in the I.C.U. and third day the doctors sent me for T.M.T. test. After looking at my condition and my papers, the doctor who was to conduct the T.M.T. test commented “which idiot has sent you for this test. You should have been sent for this after 10-15 days of rest”. I prayed to Shri Babaji Maharaj “guruji now you only take care of me” and mounted on the T.M.T. machine. I would have done only 6-7 minutes of fast walk when I started feeling pain in the chest. Suddenly the machine broke down and I stopped. If I would have taken another few steps I could have had another heart attack. However, I had full confidence in Shri Babaji Maharaj and with his picture in my mind I kept repeating his name, same way Draupadi repeated Shri Krishna’s name during her disrobing. Shri Babaji Maharaj stopped the machine which otherwise could have been fatal for me. Now also whenever I have any problems, I freely leave the problem to him with the thought “now you only take care of it; I have made mistake, now please help me in correcting it”. And he always looks after me. I have left everything to him and since I have surrendered everything to him, by his grace, all my work gets done with ease.